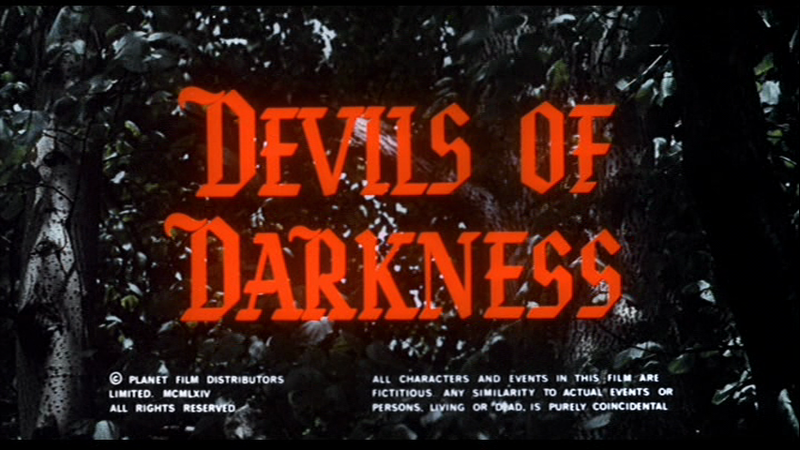 Devils of Darkness is another film that a lot of people seem to hate on for some reason. It could partially be due to the fact that during this time period, Hammer was in prominence and had raised the bar for horror so high; few could achieve their success which of course, would include this film. This picture is a British horror movie much in the same vein as many of what Hammer produce, but lighter in most departments. While Hammer’s budgets were known to be small with things trying to be done on the cheap, this movie’s budget was probably even smaller which did not help matters any. The production was not as great as it could have been and the script not as exciting nor the actors as accomplished as say Cushing or Lee, but it was a good little gothic horror nonetheless. Detailing the exploits of a vampire named Sinistre, a poor man’s Dracula if ever there was one, Devils of Darkness finds him on his quest to find new victims to sate his bloodlust. Of course, Sinistre messes up in the film, drawing attention to himself so that our hero, Paul Baxter, who is probably one of the least heroic men to be found in a film such as this, grows curious and starts an investigation that eventually leads to Sinistre’s downfall. It is not the most original plot to be sure, but the film manages to work in a little magic and voodoo to mix it up as well. It also helps that Count Sinistre is not your average vampire-type, instead forgoing all the theatrics that most movie vampires sport, yet keeping some of the most basic traits. Hubert Noël would star as Count Sinistre, the vampire and main villain of the film with William Sylvester playing opposite him as our hero, Paul Baxter. Neither man really brought anything new to the film or even any excitement. It was hard to root for one or the other as neither was a particularly likeable person. Even our damsel in distress played by Tracy Reed was not really a person you could care for though she would provide Sinistre with the young and glamorous bride he required. The one person that you kind of rooted for was Tania, Sinistre’s ‘wife’. Carole Gray would bring her to life and you kind of felt bad for her as Sinistre started to push her to the side in favour of the younger Reed. Sure, Gray was still undead and all, and had probably murdered however many people in the interim from when she was brought back from the dead to the end-point of the film, but nobody likes to be cheated on. In all, it was probably not so much the cast’s fault for being as lifeless and unlikeable as they were and more so Lyn Fairhurst’s, as she wrote the script. 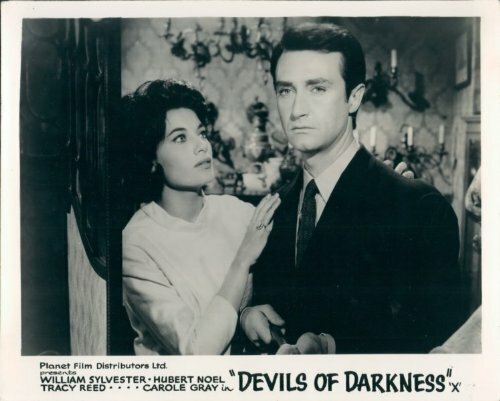 It is hard not to compare Devils of Darkness to a Hammer film as it is so alike to many of their productions. 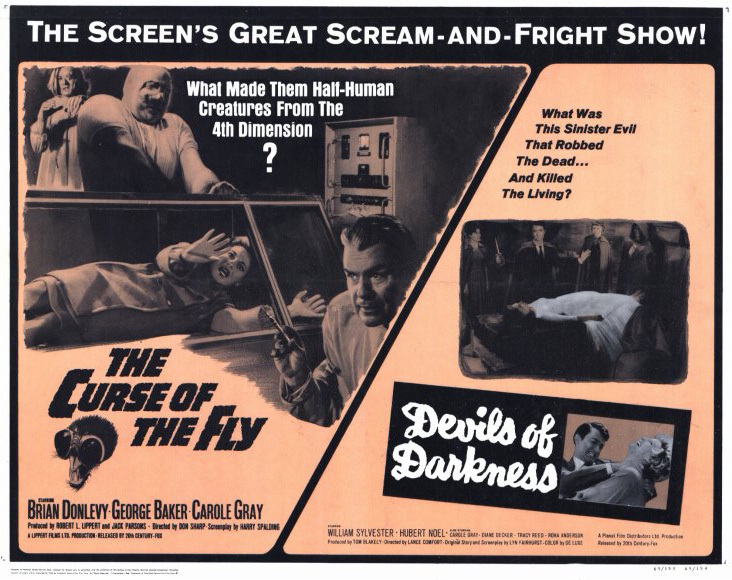 It may not look as slick as say, Horror of Dracula or even any of the later offerings in that series, but Frank Drake produced some good shots and director Lance Comfort would provide the film with a steady hand. Coming in at eighty-two minutes the film did seem too long, for even though it was slowly paced, which was fine, there were sequences within the film which could have been shortened or removed entirely to speed things up just a little bit and lend it a little extra pop. Count Sinistre had your classic, British villain look, being just a man in a suit, but Hubert Noël failed to provide any flair in the role and as such, was one of the weaker points in the film. The biggest failing of the film overall was its inability to move past from being simply average. It might have dragged just a little, and it might not have been as good as some of its counterparts and yes, it was similar to other vampire films, but it was entertaining when all was said and done. “Hammer Lite”, that is the perfect summary of this little film. Your review is very accurate IMO.